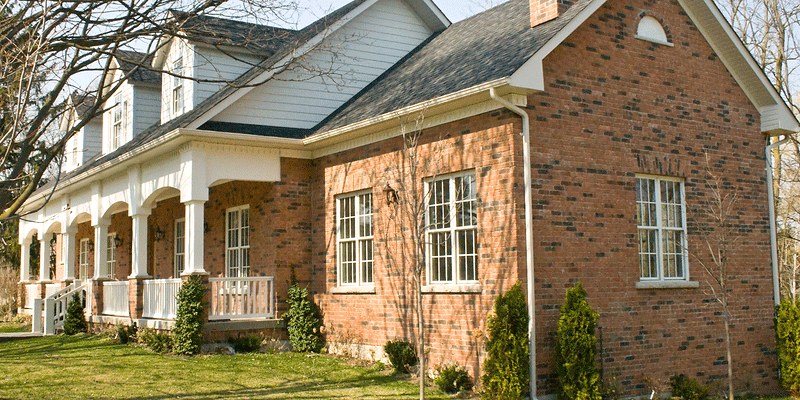 Tuck Pointing, Brick and Chimney Repair Toronto | Turnbull Masonry Ltd > Blog > Blog > Do Brick Homes Stay Cooler In The Summer? As summer heats up many homeowners wonder if Toronto’s brick homes stay cooler than homes made of other materials? With added insulation, brick homes do maintain cooler temperatures than buildings made of more lightweight materials. Brick functions uniquely from traditional insulated siding. When insulation is added to bricks it creates a dense barrier that combats well against heat and cold. Even without insulation, brick walls actively stabilize internal temperatures because heat is not able to transfer through easily or quickly. On the hottest days of summer a brick home will remain cooler, especially on lower levels. When winter rolls around, the interior of the brick wall actively absorbs and redistributes heat back inside of your house, helping to keep it warmer. Brick is an incredibly solid building material that can withstand countless generations of use, hence why it is among the most popular building materials around the world. Due to the thermal mass qualities of brick, it is one of the best materials at retaining heat. Thermal mass is the ability of a heavy, dense material to effectively store heat and then slowly release it over time, as opposed to all at once and leaving your home a hot sauna. The most common materials known for their thermal mass properties are tile and bricks. By acting as a ‘heat store,’ brick stores and very slowly releases heat over time. Materials that do not reflect or store heat very well include wood, aluminum, vinyl and artificial stucco. These are all lightweight building materials that allow cold and hot temperatures to easily flow in and out. If you live in a stucco or wood home, as opposed to a brick home, you are going to be warmer in the summer and colder in the winter. If you run your AC, the thermal mass of bricks helps keep cool temperatures in and heat out, especially if your windows are energy efficient and airtight. As a result, you’ll save money on energy costs. Aside from keeping your home cooler in the summer and warmer in the winter, brick homes add value in several other ways as well. Brick is not immune to moisture damage but it is better at absorbing and releasing moisture than other materials. As a result, it tends to be less likely to develop rot, insect infestation, mold growth and other issues when compared to wood and other building materials. Brick can be recycled over and over, making it a much more eco-friendly option. Plus, it’s made from mostly shale and clay, which are some of the most plentiful materials in existence. No forests have to be wiped out for the production of brick. Plus, during the manufacturing of brick, all materials are utilized so it produces little to no waste. Siding Helper reports that brick can add as much as 6% to your overall home value. Not only does it offer that classically beautiful look that ups curb appeal, but also it is known for its strong and long-lasting qualities that may prove valuable in other ways. Brick requires less repairs over time, especially when you keep up with small maintenance needs. Brick homes tend to require little to no maintenance besides the occasional cleaning and spot-checking for the first 25-years. Over time mortar and individual bricks may need to be replaced, but the overall structure should remain hearty so long as necessary maintenance is conducted in a timely fashion. Brick homes are also largely resistant to termites and weather, as well as fire. Sure, brick can burn down, but it’s going to do so much slower than a wood house. As a result, brick homes are often less expensive to insure. Insulation acts as the main barrier to heat, but brick helps further stabilize the internal temperatures of your home by obstructing much of the heat from entering into your home. A brick home will always be cooler in the summer and warmer in the winter than homes made of other, lighter weight materials. Some of the oldest buildings still in existence are built out of bricks. If you want your home to surpass the test of time, what better material than brick? You can add brick to any home, either through a front porch, detailed siding, chimney or walkway. There are so many ways to add the value of brick to your home. For all brick repairs, maintenance and rebuilds, contact the leading professionals at Turnbull Masonry!